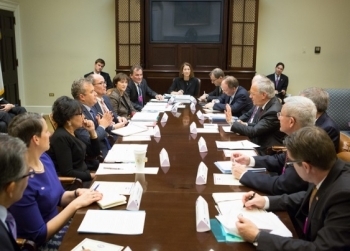 Home › Newsroom › Press Releases › 2015 › January › U.S. Commerce Secretary Penny Pritzker, U.S. Labor Secretary Thomas Perez, Senior Advisory to the President Valerie Jarrett and NEC Director Jeff Zients Host Swiss Vice President and Delegation of Leading CEOs for Discussion on Investing in the U.S.
U.S. Commerce Secretary Penny Pritzker, U.S. Labor Secretary Thomas Perez, Senior Advisory to the President Valerie Jarrett and NEC Director Jeff Zients Host Swiss Vice President and Delegation of Leading CEOs for Discussion on Investing in the U.S.
U.S. Secretary of Commerce Penny Pritzker, U.S. Secretary of Labor Thomas Perez, Senior Advisor to the President Valerie Jarrett and Director of the National Economic Council Jeffrey Zients today hosted a delegation of Swiss business leaders in Washington, D.C. The delegation, led by Vice President of the Swiss Confederation, Federal Councillor Johann Schneider-Ammann and U.S. Ambassador to Switzerland and Liechtenstein Suzan LeVine, included chief executive officers and senior executives from Alevo Group, Bühler, Kudelski Group, Nestlé, Novartis, Pilatus Aircraft, Reha Technology, and Zurich Insurance Group. This delegation was invited to the United States as part of an Administration-wide effort to expand job-creating foreign direct investment (FDI) through the SelectUSAprogram, which is housed within the Department of Commerce. The eight executives announced plans to invest approximately $3 billion in their U.S. operations starting in 2015, reflecting strong and persistent growth of Swiss investment in the U.S. economy. Several of the participating companies have also committed to attending the 2015 SelectUSA Investment Summit, to be held in March. Swiss foreign direct investment (FDI) into the United States grew by 115 percent from 2009-2013, from $65 to $140 billion. Switzerland is the 6th largest source of FDI in United States, and U.S. subsidiaries of Swiss firms employed more than 472,200 U.S. workers in 2012. Swiss investors are the top international source of research and development (R&D) investment in the United States, spending nearly $9.4 billion in 2012. The participating companies shared feedback on the U.S. investment climate and on opportunities to partner on workforce development. Executives described how they are adapting the unique Swiss model of apprenticeships to the United States to strengthen both their competitiveness and their local communities. Apprenticeships, which allow workers to “earn while you learn,” have long been recognized as one of the best training models for skilled trades, but have been underutilized in the United States. Several European countries, including Switzerland, have incorporated the apprenticeship model as a major tool to develop a skilled workforce. Today’s meeting provided an opportunity for Swiss business leaders to share their experiences with apprenticeships and how that model can be expanded in the United States. These consultations, as well as a recently announced $100 million grant competition, are meant to achieve President Obama’s goal of doubling the number of registered apprenticeships in the U.S. over the next five years. By partnering with Swiss companies to expand and start new registered apprenticeship programs, we will strengthen the pipeline of U.S. workers for in-demand jobs. · Thomas Bosshard, President and CEO, Pilatus Business Aircraft, Ltd.